Dhruva Jaishankar: Where is this relationship going? The following article originally appeared in The Indian Express on November 8, 2008. Barack Obama will assume the US presidency on January 20, 2009. While his foreign policy platform is likely to take on greater clarity, three items on his tentative agenda should be eliciting attention in New Delhi, apart from his handling of the US economy, which will be of great significance for the rest of the world. “But, for us to devote serious diplomatic resources to get a special envoy in there,” he added, “to figure out a plausible approach, and essentially make the argument to the Indians, you guys are on the brink of being an economic superpower, why do you want to keep on messing with this? ... I think there is a moment where potentially we could get their attention.” Obama also revealed that this was something he had spoken about with former president Bill Clinton. Nuclear non-proliferation: Obama has promised to make attempts to ratify the Comprehensive Test Ban Treaty, a task which may be made easier given significant Democratic gains in this year’s Congressional elections. He is also likely to begin negotiating a “verifiable ban on the production of new nuclear weapons material.” Obama’s explicit end-goal is to work towards a world without nuclear weapons. Two of his advisors , Ivo Daalder and Jan Lodal, have argued along such lines, adding that China and India are likely to sign on to the logic of a nuclear free world. “China and India have both adopted the formal position that they will not be the first country to use nuclear weapons - essentially an affirmation that they would consider their nuclear capabilities superfluous if others had no nuclear weapons to use against them,” Daalder and Lodal recently wrote. He added: “We need a global response to climate change that includes binding and enforceable commitments to reducing emissions, especially for those that pollute the most: The US, China, India, the European Union, and Russia.” Obama’s campaign website elaborates that this would involve working within the UN Framework Convention on Climate Change, and establishing a Global Energy Forum based on the G8+5, which includes India. 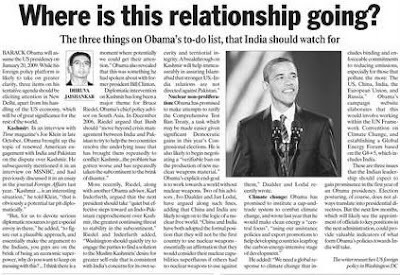 These are three issues that the Indian leadership should expect to gain prominence in the first year of an Obama presidency. Election posturing, of course, does not always translate into presidential directives. But the next few months, which will likely see the appointment of officials to key positions in the next administration, could provide valuable indicators of what form Obama’s policies towards India will take.